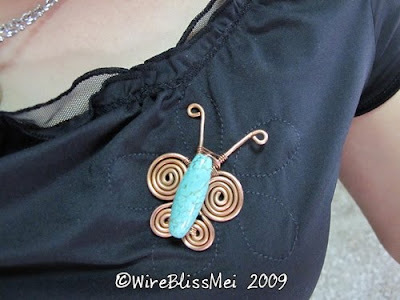 A simple copper wire butterfly. Just simple swirls wrapped together with 24ga copper wire. Very roughly done as I am actually planning for a pair of earrings but this one is quite heavy. The wings (swirls) consist of very thick copper wire - maybe 16ga or thicker. Mei that's lovely! The copper goes very nicely with that bead too. Very nice Mei...butterflies are very popular these days!! !